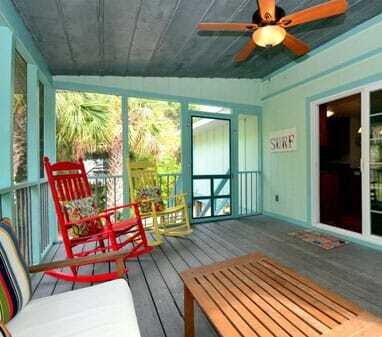 High end vacation rental home at Folly Beach!! This 2700 sq. foot elevated home comfortably sleeps 10 guests with 2 king beds, twin over full bunk bed, a full bed with a twin trundle, and a queen sleeper sofa. Just a few streets from the 6th St. East beach access and located on a secluded dead-end street… “Sandin Your Shoes” is the place for your Folly vacation. Enjoy hitting the beach for the day…play a little ping-pong or corn-hole at the house…enjoy an outdoor shower and then walk up the stairs to this spacious & luxurious home. The property is strictly non-smoking and not pet friendly. No events allowed that exceed the maximum occupancy of the home. Must be 25 years old or older to rent. We hope to see you soon on Folly Beach!